Federal/Local Government – First Line Facial Recognition is a proven added benefit to our first responders in many areas of the government. Blue Line Technology is working with airport administrators and was recommended as an added feature for metal detectors in venues such as high security political meetings, protection of dignitaries and court buildings. Our system can also be expanded geographically to include identification of known threats at TSA airport metal detectors. 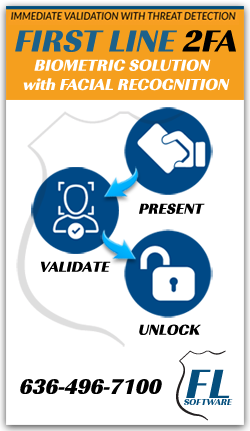 First Line Facial Recognition is ideal for local municipalities not forced to provide added screening prior to their monthly meetings. The DEA has demonstrated the system’s effectiveness in investigations with terrorists, drug couriers, wanted subjects, etc. Military bases are on constant alert, and First Line Facial Recognition provides the assistance our soldiers need guarding weapons storage areas, barracks, embassy assignments and dignitary protection (Secret Service), especially during election periods. Locally, law enforcement can protect their evidence rooms and weapons storage areas.